If you’re looking to pick up a portable battery charger on the cheap, then you don’t look to need any further than the HUE Stik. 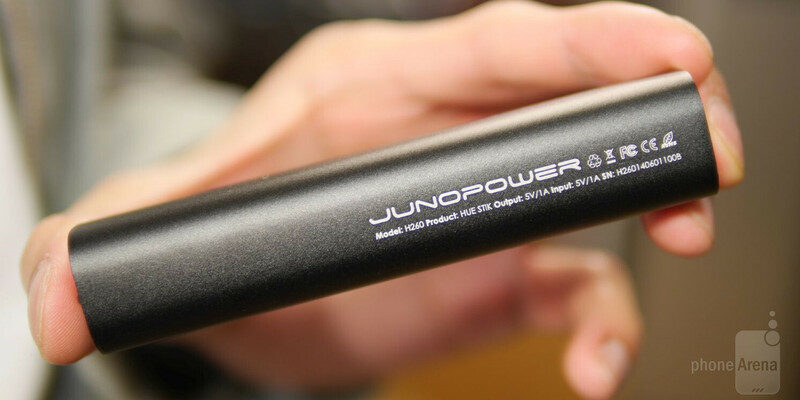 Occupying a small amount of space in your pockets, the HUE Stik by JunoPower is a long, cylindrical shaped charger that packs along a single USB port and an internal battery capacity of 2,600 mAh. Indeed, the capacity might be insignificant in comparison to other offerings, but its compact size and $21.99 cost might prove valuable to certain people. Even though there’s a sprinkling of premium to the HUE Stik’s design, one that’s constructed out of a sleek aluminum casing, its overall design still can’t hide the fact that it’s a conventional looking thing at the end of the day. However, we will certainly say that it’s a pint-sized thing that can be easily thrown into our pockets without much notice – plus, its weight of only 6 ounces makes it even more discrete. Looking around, there’s a single button on one end that initiates the charging process. On the other end, there’s a microUSB port that’s used to charge its internal battery, a full-sized 1 amp USB port, and an LED light that turns it into a handy flashlight. Plugging a Samsung Galaxy Note 4 to it, we’re only able to generate a maximum charge of 75% from its dead state. That’s a far cry, honestly, but we have to bear in mind that the compromise made with its compact size is its battery capacity. For devices with smaller sized batteries, the HUE Stik should suffice to give them full charges. And of course, it’s undoubtedly the kind of thing that’s good to top off our devices – as opposed to recharging them fully. Yeah, the HUE Stik isn’t our first choice for a portable battery charger solution, seeing that we have a wealth of devices to worry about, but again, we have to stress that it’s a modest unit for those who have to worry about only a single device. Sporting a price of $21.99, that’s barely going to cause any rift to anyone’s wallet – so it’s not going to cost you an arm or leg to pick it up. In all fairness, there are other battery chargers that offer more versatility than this, for a little bit more money of course, but if you’re only concerned about traveling light and only a single device, the HUE Stik might pique the interest of some. Pretty soon I think these types of accessories will not necessarily be needed anymore. Not only are they improving battery technology but improving charging methods as well. The only thing left that I think they should add to phones is a solar charger built in. They are going to be needed for a long time yet, batteries are taking longer to develop then most components. I happen to use my Anker 6400mAh battery all the time. As for the solar charger idea, the phone would have be thicker and larger just to charge the phone very slowly. This wouldn't even work in your pocket or bag. It wouldn't be worth it.